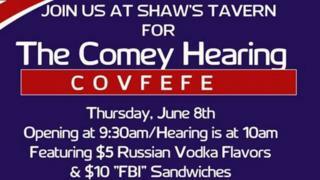 Image caption Shaw's Tavern in Washington DC is hosting a "covfefe"
At Clooney's Pub in the Mission district of San Francisco, the bartenders are preparing for a busy morning. Former FBI director James Comey's testimony before Congress about his interactions with President Donald Trump is hotly anticipated by many Americans, and some of them want to tune in with a drink in hand. "So many people have been talking about it," bartender Kim tells the BBC. "We've been getting so many calls and people have been asking to make reservations. [They're asking] 'Can I get a seat? 'Are you serving breakfast?' I was like, you guys, it's a Thursday morning, it's like any other Thursday morning here." Still, she has some drink specials prepared for punters who will seat themselves around the horse-shoe bar, eyes glued to the television. There's the "KGB" (with Kahlua liqueur, ginger and brandy); the special "Comey Coffee" for those up earlier than usual, and of course the "Impeachment", with peach schnapps and mint liqueur. And Clooney's is no exception. Pubs from Washington to Houston to Virginia and New York are opening early for the event, and some are even offering "Covfefe" cocktails. Of course, the prospect of President Trump firing off live missives on Twitter as James Comey speaks is only heightening the anticipation. The Union Pub on Capitol Hill is pledging to give out free rounds of Budweiser beer or bourbon shots every time the president tweets. Bar manager Ashley Saunders told the New York Times there won't be any limit to the rounds, even if Mr Trump goes into overdrive on his smartphone keyboard. Americans found out through prepared testimony on Wednesday what James Comey will say in his opening statement, including that the president wanted a "patronage relationship" and asked for his "loyalty". The focus now will be on his response to questions from the 15-member Senate Intelligence Committee. The BBC's Anthony Zurcher likened the pre-released remarks to a "sneak preview of a blockbuster movie". Blockbuster seems apt, with the major US commercial TV networks (and, as would be expected, the cable news channels) set to carry the testimony live - a hint they are expecting a huge audience. The event is being compared in US media to the few Congressional hearings from years gone by that have stuck in the American consciousness and received live TV broadcast treatment: Watergate in 1973; the Iran-Contra affair in 1987; Anita Hill's allegations of sexual harassment during Judge Clarence Thomas Supreme Court confirmation hearings in 1991; and the Bill Clinton impeachment hearings in 1998. Whether the testimony really lives up to the hype might not matter to those at Clooney's after a few KGBs.